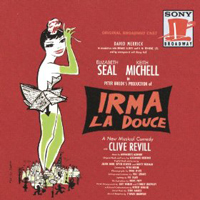 Original Broadway Cast, 1960 (Columbia/Sony) (4 / 5) One of very few French musicals to earn success in London and in New York, Irma la Douce went through some changes in each country, but this recording retains enough Gallic charm mixed with Broadway know-how to satisfy all but the most curmudgeonly of FrancophiIes. That’s particularly evident in the orchestrations of André Popp (additional orchestrations by Robert Ginzler, dance music by John Kander), with the obligatory accordion and a stylish xylophone often dominating. The overture is an old-fashioned attention-grabber. The opening number is “Valse Milieu,” in which Clive Revill as Bob-Ie-Hotu — who narrates the story and plays numerous other roles — sets up the plot and defines the French words that are sprinkled throughout the piece: poule for prostitute, mec for pimp, grisbi for money, and so on. The fanciful tale tells how one of Irma’s clients, Nestor, falls so in love with her that he wants to become her only client. The music is by Marguerite Monnot, composer of many songs popularized by Edith Piaf; the original French book and lyrics by Alexandre Breffort were cleverly adapted into English by Julian More, David Heneker, and Monty Norman. London leads Elizabeth Seal, Keith Michell, and Clive Revill also starred in the Broadway production. Seal, who won a Tony Award for her performance, is a singing actress whose personality jumps from a recording. Michell as Nestor has a beefy, full-bodied sound in the love duets, is comedic in “Wreck of a Mec,” and is magnificent in the haunting “From a Prison Cell.” Revill is especially funny in the climactic “But.” The all-male ensemble is excellent in “Sons of France,” “She’s Got the Lot,” and “Christmas Child.” There is also an extended sequence that ends up in an “Arctic Ballet” complete with penguins! It doesn’t make much sense, but the dance music is terrific. 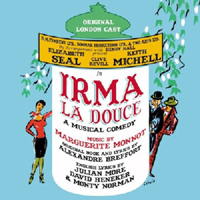 In his New York Herald Tribune review of Irma la Douce, Walter Kerr wrote: “If an original cast album is made available in your neighborhood, get it.” Take Mr. Kerr’s advice. — J.D.